Vera Cohen née Betesh [Class of 1934] aged 102, recently caught up with Centenarian alumna and neuroscientist, Brenda Milner, via phone, to share memories about School & chat about their mutual passion for Manchester City Football Club. Vera, and her sister Olga Halon [Class of 1938] were recently featured on BBC’s Sports Personality of the Year as special guests. This week, Vera and her friend, Old Girl Jennifer Sandler [Class of 1960] popped in for an informal chat with the Development Team. Vera was a pupil in the 1930s with fond memories of her headmistress Miss Grant [1908 -1938] who was always kind to her pupils. 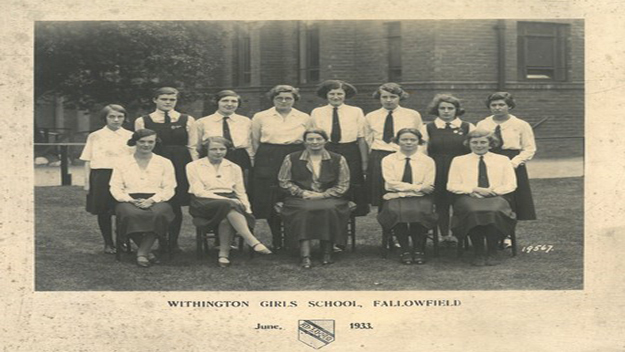 At school, she spent her time enjoying sport and according to the School Newsletter, 1933-1934, she was Scott’s House Captain, Tennis First Captain, and one of six prefects. 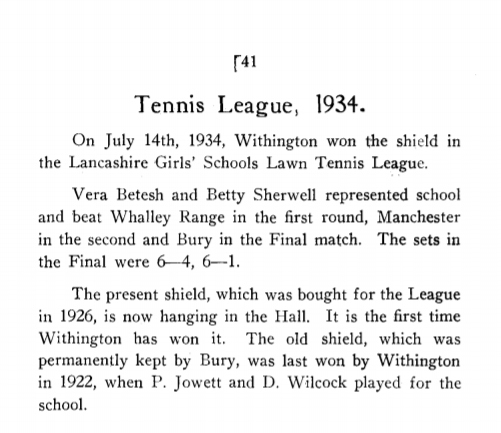 Vera helped Withington for the first time to win the Lancashire Girls’ Schools Lawn Tennis league. At 102, her recall of Withington and her friends is evident and, when asked, we put Vera in touch with Brenda Milner, who recently featured in Withington Onwards magazine 2018. Vera said, “Brenda phoned me straight away, and I was really happy to speak to Brenda, but unfortunately it was cut short which was sad, but we talked about having high tea and fish at her house and although she was two years behind me at school, we both clearly remember being friends. Brenda was very bright at school. We enjoyed sharing stories of our time in Didsbury and hearing Manchester City Football Club games at Maine Road in class.” Vera’s grandson currently lives in Montreal, and he will shortly be catching up with Brenda’s academic colleague, Dr Gabriel Leonard, to give Brenda a new blue Withington mug. Vera and Olga were in the spotlight last year as Manchester City’s mascots for MCFC’s match against Fulham. 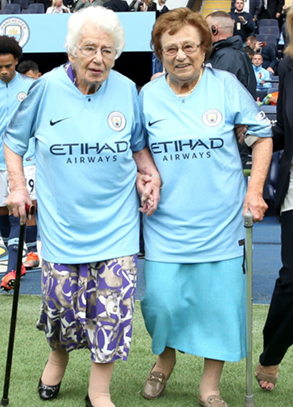 Both are lifelong city fans and have been season ticket holders for 85 years! Vera was led through the tunnel and onto the pitch by David Silva and Olga Halon by Fernandinho. They were also joined by Vera’s great grandsons, Max and Sammy Goldsmith. Because of their MCFC honour, Vera and Olga were special guests at last year’s BBC Sports Personality of the Year at Birmingham Resort World Arena. The sell-out crowd included other special guests the divers who rescued the Wild Boars football team from a flooded cave in Thailand. Vera said she appreciated the opportunity to attend with Olga and her grandsons. But, with12,000 guests in attendance, Vera thought she was situated too far away from the stage. The event was broadcast live on TV and hosts Gary Linker and Clare Balding graciously highlighted their attendance at SPOTY and for being the oldest-ever Mascots at a City game.